CHICAGO, IL--(Marketwired - September 19, 2017) - CERTUS™, innovators in food safety technologies, announces the signing of an exclusive license agreement with BD (Becton, Dickinson and Company), a leading global medical technology company for use of the company's rapid pathogen detection technology. Enabled by BD's proprietary SERS nanoparticle technology, the newly introduced CERTUS System will make food safer by providing small to mid-sized producers fast, easy and cost effective ways to detect environmental Listeria in food processing environments and the food itself prior to reaching consumers. "This is a critical agreement for CERTUS as BD's technology provides the foundation of our patented Grow, Read, Detect system giving producers real-time monitoring through simultaneous enrichment and detection," said CERTUS President, John Coomes. "We believe our approach, backed by BD's long-standing expertise in nanotechnology, is a significant industry breakthrough that radically simplifies what was once a complex process. This will enable any food processor to conduct safe and easy on-site testing, receive instant alerts, and take action to remediate any issues." BD's exclusive license to CERTUS also includes technology to enable pathogen detection in a bio-contained tube during enrichment so that the facility where the testing is conducted is not exposed to enriched pathogens. BD continues to work with partners to further develop the SERS technology and is currently the supplier of SERS nanoparticles used in CERTUS products. The first commercial CERTUS System will be launched in 2018 for environmental monitoring and prevention of Listeria spp. "The beauty of our system is that anyone with minimal training will simply swab a surface, add media to our Bio-Lock™ Detection Tube, and insert the tube into the Detection Unit to start getting rapid results," continued Coomes. "There is no need for centrifuges, incubators, pipettes, stomachers, bags or other ancillary items and steps that current methods require." 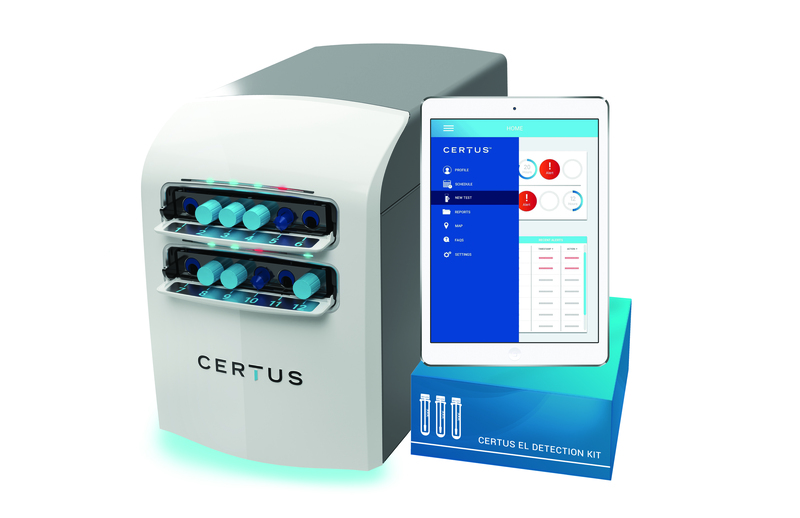 Since their IAFP debut earlier this year, CERTUS has developed multiple prototypes which are now being used in the U.S. and Europe for optimization of the CERTUS EL Detection kit. Further development of the system will involve seeking AOAC validation and launching a research and development program for CERTUS Environmental Salmonella Detection Kits. For more information on CERTUS visit certusfoodsafety.com. CERTUS changes the way food safety testing is done, and helps reduce food-borne illness with a new generation of food pathogen detection devices and processes that are precise, affordable and easy to use. Making rapid pathogen detection and prevention Simple, Safe and Smart, CERTUS is built on the foundations of empowerment, simplicity, precision, and integrity. CERTUS seeks to integrate historically embraced values into future technology to bring innovation and expansive vision to the food safety industry. CERTUS joins the Toho Technology group of companies as a new brand specializing in Food Safety. Founded in 1819 in Nagoya, Japan, Toho is a privately-held company that provides engineering, manufacture, distribution and support of diverse industrial and life-science technologies to customers around the world. With significant expertise in precision instrumentation and equipment sales, Toho Technology advances the way products are made, tested and verified within the fields of food safety, healthcare, and nanotechnologies. The company currently operates multiple facilities in Chicago, Illinois; Japan; Shanghai, China and Jakarta, Indonesia. Toho Technology Inc. is the launch site for the CERTUS global expansion with all R&D, operations and sales centered in its Chicago location. CERTUS has signed an exclusive license agreement with BD, a leading global medical technology company for use of the company's rapid pathogen detection technology.